Survey administered to general surgery residents in the northeast across 9 states. Participants reported demographics and rated their confidence level in performing a number of open surgical procedures on a Likert scale ranging from 1 to 5 where 1 indicated “Not Confident” and 5 indicated “Extremely Confident”. Participant responses that indicated confidence in performing various surgical procedures. Resident demographics and training environment differences were analyzed to reveal differences in surgical confidence for various surgical procedures. 99 responses were obtained from fifth year surgical residents. 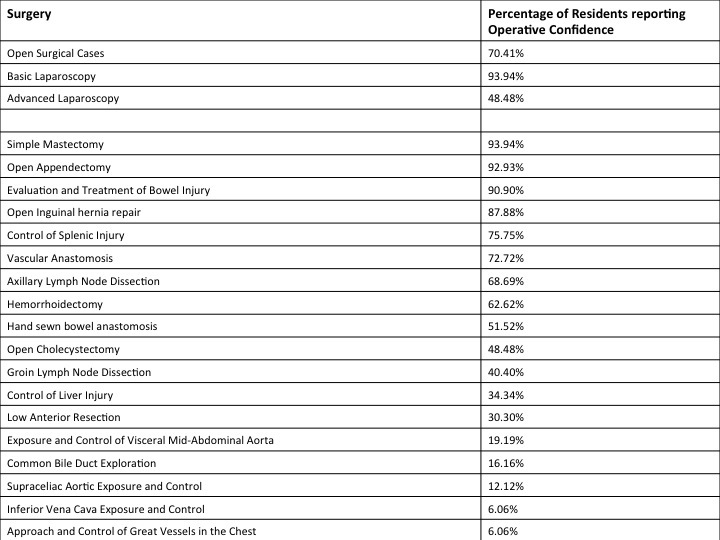 Table 1 indicates percentage of PGY5 residents expressing confidence at performing the analyzed surgical procedures. Training at a University Program was associated with decreased confidence at performing open general surgical procedures, but increased confidence in performing advanced laparoscopic surgery and open vascular surgery. Increased surgical volume was also associated with increased confidence in performing laparoscopic as well as a number of open procedures. Graduating surgical residents indicated a significant lack of confidence in performing a variety of open surgical procedures. Program type was associated with variations in reported confidence in open general surgery and vascular procedures.